2014 | I Style Me Girl! 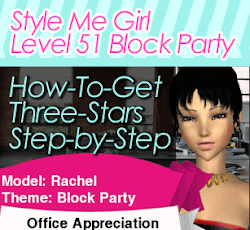 Style Me Girl Level 51 - Block Party - Rachel - Step by Step How To! For those having difficulty on Style Me Girl Level 51, "Block Party," theme with model Rachel, I am posting step by step instructions on how to not only pass this level, but pass with a "Stunning!" three stars. I am posting this important updated "three star" example of Style Me Girl Level 18, Halloween Theme with model Penelope thanks to the comment of a visitor that brought to my attention a crucial problem within my existing post for this level. (Thank you kind visitor for the comment!) The issue exists no more in this new "three star" example of Style Me Girl Level 18! Read the full post for item details and images. I aimed for a style "worthy a queen," when styling model (or is it princess) Isabelle for Fashion Party Dress Up Level 24, Ball theme. I do think Isabelle looked pretty as a princess with her tiara and beautiful gold gown with matching gloves, and I earned three stars for the look. Read the full post for item details and images on how I earned three stars on Fashion Party Dress Up Level 24. Nalia hits the Red Carpet in Level 23 of Fashion Party Dress Up as "Red Carpet," is the theme. I got to use my favorite dress from the game, a pretty purple scroll designed number and matching shoes. Three stars called for a "bow" accessory, I wasn't sure which so I used a red hair bows and a red bow necklace! Item descriptions and details on how I got three stars on Fashion Party Dress Up Level 23 included in the post! It's Nalia's special day in Wedding Theme Level 22 of Fashion Party Dress Up. Shoes often make the dress and this has never been more true than in this level. Three stars on Level 22 came not without a certain pair of purple heels along with a white dress for Nalia. Keep reading for more info! Bad girls, Fashion Party, Fashion Party Dress Up, L21, Level 21, Model Trixie, Punk Rock, Rocker, Stunning!, Theme Punk Rock, Theme Rocker, Three Stars, Trixie, whatcha gonna do? Trixie is introduced as the model in Fashion Party Dress Up Level 21, with "Rocker" or "Punk Rock," the theme. With a rockin' red and black do' and some bad girl attire I gave model Trixie a three star worthy punk rock look. Read the full post for item description and images. Labels: Bad girls, Fashion Party, Fashion Party Dress Up, L21, Level 21, Model Trixie, Punk Rock, Rocker, Stunning!, Theme Punk Rock, Theme Rocker, Three Stars, Trixie, whatcha gonna do? Anne, Costumes, Fashion Party, Fashion Party Dress Up, L20, Level 20, Model Anne, Stunning!, Theme Costumes, Three Stars, Trick or Treat! Halloween is the variety in Fashion Party Dress Up Costumes Theme Level 20 with model Anne. To get three stars on this level, a creepy look for Anne was in order, so I swapped her blonde locks for a red and black do and outfitted her to match. Read on for all the details on how I get three stars on Fashion Party Dress Up Costumes theme Level 20. Labels: Anne, Costumes, Fashion Party, Fashion Party Dress Up, L20, Level 20, Model Anne, Stunning!, Theme Costumes, Three Stars, Trick or Treat! Model Danielle is "The Show Stopper," at the "Dolphin Show," themed Level 19 of Fashion Party Dress Up. Dressed in blue to match the event, I received three stars for Danielle's "Dolphin Show," style. All the details on how I styled Fashion Party Dress Up Level 19 to earn three stars are in the post! It's time to "let the creative juices flow," in Crafting theme Level 18 of Fashion Party Dress Up with model Anne. I gave Anne a three star, "stunning," look she could get crafty in complete with gloves so she wouldn't get her hands dirty doing it! Read on for all the details on how I earned three stars on Fashion Party Dress Up Level 18 Crafting theme. I aimed for gold with my styling of model Anne in Fashion Party Dress Up Level 17, "Active," theme, and earned three stars for my effort! Comfortable attire and athletic footwear were key to my three star "Active" styling, read on for the full details! What better time to rock a nice pair of shades than in the summertime, right? In Fashion Party Dress Up Level 16 "Summer Picnic," I had model Danielle rock the super cool pair of white sunglasses I received as a signature item. I earned three stars for the shaded style, read more for item description and wardrobe images. Anne, Fashion Party, Fashion Party Dress Up, Hip Hop, L15, Level 15, Model Anne, Stunning!, Theme Hip Hop, Three Stars, Yo got Stylez! Yo, got stylez? Word up! The theme is Hip Hop for Fashion Party Dress Up Level 15 and Anne is the model. The three star style I gave Anne for this level is definitly not thuggish, she's not a "G," but it is very playful and fun. Read on to get the deets! Labels: Anne, Fashion Party, Fashion Party Dress Up, Hip Hop, L15, Level 15, Model Anne, Stunning!, Theme Hip Hop, Three Stars, Yo got Stylez! The tagline for Horse Eventing Theme Level 14 in Fashion Party Dress Up is, "Everybody likes horses." But that's not true, I don't like horses. I love them! And for this level I drew inspiration from My Fair Lady with model Anne in a Cecil Beaton-esqu hat. Full description in the post. Getting three stars for "Pool Party," themed Level 13 in Fashion Party Dress Up required a few tries before I was successful. Each time I failed I noticed that a checkbox with a dress icon labled "Polka dot" remained unchecked. I caved in and purchased the only polka dot dress I could find, for $12 cash, and viola! I got three stars. Read on for more details. The style I gave model Nalia in Fashion Party Dress Up's Level 12 Officewear theme doesn't scream "officewear," but it is office appropriate and more importantly :) it earned me three stars for the level. I chose a belted knee length dress with a high collar (none of that plunging neckline stuff in the office!) and closed toe heels. Read the full post for the specifics! I always thought the "cowgirl," look was cute, so Fashion Party Dress Up Level 11 Cowgirl theme was fun, though I wish there were more hats and hairstyles to choose from. I ended up going with long brown hair and a straw colored hat. Read further for all the details on how I styled Anne for Fashion Party Dress Up Level 11 Cowgirl theme. "The heat is on," in Fashion Party Dress Up Level 8, where the the theme is "Cooking." Another new model is also introduced, Anne, whom makes like suzy-homeaker for the cooking theme! Read on for the details on how I styled Anne for Cooking theme Level 6 in Fashion Party Dress Up. Making her second appearance is model Nalia in Fashion Party Dress Up Level 7, Floral theme. With floral patterned dress and flower accessories, I earned three stars for her floral style. Continue reading for details on the "Floral" themed styling I employed for Fashion Party Dress Up Level 6. Level 5 of Fashion Party Dress Up had me "thinking pink," as "Pink," the color, was the level's theme. So I decked model Danielle in some super feminine pink attire fit for a Victoria's Secret model! Read on for details and images on how I styled model Danielle in Fashion Party Dress Up Level 5 Pink theme and earned three stars. Glamour is the theme of Fashion Party Dress Up Level 3 modeled by Nicky. In this level it was "Sparkle Sparkle" time, so I made use of Fashion Party Dress Up's many purple items and accessories to make a three star worthy Glamour style. Continue reading to see how I styled Nicky in Level 3 Glamour theme. Level 2 of Fashion Party Dress Up features model Danielle whom we've met in Level 1. This time, the theme was High School, "On Familiar Grounds." Continue reading for details on how I earned three stars for Fashion Party Dress Up Level 2 High School Theme. While eagerly awaiting new Style Me Girl and Teen Vogue Me Girl levels, I started playing Fashion Party Dress Up to get my style fix. So I decided to post my three star examples for Fashion Party Dress Up too. Read on to see how I earned three stars on Level 1 Trendy theme modeled by Danielle. Updated: Style Me Girl Level 55 - Mermaid - Fara - NO CASH ITEMS! Mermaid Theme Level 55, "The Fin Crowd," modeled by Fara is the latest Style Me Girl level I passed and received three stars on without using any gold $ cash items. Continue reading for the details on how I styled Fara and to view Closet screen capture and snapshot images. Updated: Style Me Girl Level 20 - Dream Theme - NO CASH ITEMS! In this post I am sharing an example how I was able to attain three stars on Style Me Girl Level 20, "Angelista" Dream Theme modeled by Fashion Angel without using any cash items. I briefly described how to do this in an earlier post, but I decided "Angelista" deserved a proper "no cash items" update. Updated: Style Me Girl Level 48 - Victorian - Dot - NO CASH ITEMS! I am happy to share another "three stars with no cash items" update. Style Me Girl Level 48 Victorian modeled by Dot has been posted on this blog before, however, two items used in that post's example are gold $ cash items. I know what it's like to have limited cash to spend in the game, so it's been a goal of mine to revisit such levels and get a three star rating without using cash items. Updated: Style Me Girl Level 56 - Yacht Party - Victoria - NO CASH ITEMS! Updating Yacht Party Level 56 modeled by Victoria was a cinch! Even though I loved the dress I used in my original post, it was a gold $ cash item, so a "no cash item" update for "Evening at Sea," was in order. Continue reading for the details and images. Updated! Style Me Girl Level 22 - Haute Couture - Three Stars With NO CASH ITEMS! Updated: Style Me Girl Level 16 Princess - NO CASH ITEMS! I'm posting how to get three stars on Style Me Girl Level 16 (Princess Theme with model Alexis) again because I realized that the dress I used in my first post, was a $ gold cash item. For those that have limited cash on Style Me Girl, I wanted to provide a more attainable option. Updated: Style Me Girl Level 32 Formal - NO CASH ITEMS! Level 32 Formal Evening Theme, is one level which I used a $ gold cash item. I posted it earlier but I wanted to post a better example, one WITHOUT using any cash items. Updated: Style Me Girl Level 24 Nautical - No Cash Items! Level 24 Nautical Theme was one of the more challenging Style Me Girl levels for me. In order to achieve a three star result, I had to buy and include a gold cash item. So in my first Nautical Theme three star example, a few gold cash items are used. Updated! Style Me Girl Level 6 - Boho - NO CASH ITEMS! I found a way to pass Level 6 Boho Theme with a "stunning," three stars and I did so WITHOUT using any $ gold cash! Everything on this example is either free (comes with the game) or bought with the much more abundant and easier to obtain silver coins. In my earlier Boho Theme post, three items required to get the desired three star results cost $ gold cash.